These are not entirely new phenomena (see the citation from St John Chrysostom in the preceding post). There has long been a bias in the direction of flattery, which is why it is so effective for politicians. There are, nonetheless, some differences in this early 21st century. Consider the matter of attention spans. In our time, the short attention span appears to be the result of minds conditioned to flit from one thing to the other. 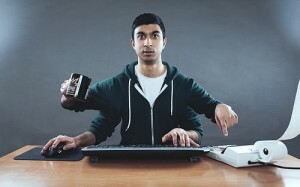 Several recent books link this to our “always connected” lives, where the mind easily indulges every mental impulse, never staying on any one task for more than a couple of minutes. However, I think our contemporary workplaces, for those in white-collar and service industries, fuel this as well. Workers in these jobs are expected to multi-task, responding promptly to communications from numerous channels (email, phone, instant message, etc. ), often when not at work. They tackle little issues as they continually arise even as they labor at larger efforts. Interrupted work becomes the norm. It eventually gets done, but it doesn’t happen in extended, sustained application of effort. Mass media has already adapted to these hearers who, like sprinters forced to run a marathon, lack endurance. Television programming is dominated by short programs (20-22 minutes, once advertisements are removed) characterized by brief sketches that have rather little connection to each other. Even if the commercials are skipped (a common practice with cable/satellite boxes), they mark an interruption in the program. Televised sports have frequent breaks for advertising, instant replay, and repetitive commentary. (Those paying for the privilege of watching the game played live instead receive the endless distraction of the Jumbotron and snippets of AC/DC riffs.) Politics is reduced to sound bites. Why listen to an entire speech, when the slanted-news-of-your-choice can extract the five ten-second sound bites you need to hear? Talk radio combines the worst features of all of the preceding examples. What can the preacher do? Is he compelled to shorten sermons to seven minutes or less, about the duration between commercials on television? Must he really repeat himself over and over to make the simplest of points? Is the visual aid – perhaps displayed on a projection screen – a real requirement to be effective in our time? The long-term solutions involve effort. The pastor must encourage his listeners to read the Scriptures in larger chunks, starting with the daily appointed pericopes and then moving to larger units like entire chapters. This helps build endurance, but listening, too, needs help. Audio books and bibles are a great way to do this, and are readily available (search for “free mp3 bible”). They transform errands and commutes into time that is both spiritually profitable and good “exercise” for the ear. Prayers are also available; Holy Cross Hermitage offers morning and evening prayers plus the prayers in preparation for Holy Communion in both CD and downloadable formats. The preacher must also challenge the faithful (and himself!) to “disconnect” for a time every day. This starts with regular prayer, but it doesn’t need to be confined to specifically spiritual pursuits. Just spending more time reading without jumping over to see what’s happening on Facebook, listening to lectures, playing board games with the family, and going on walks and hikes without audio accompaniment are all therapeutic for the short attention span. Parents in particular must be encouraged to cultivate these same skills in their children. We don’t (or shouldn’t) let our kids subsist on a diet of cheese curls and ice cream, so we must avoid the same thing as regards their intellect. Improvement is not instantaneous. The preacher in our time will almost undoubtedly find it necessary to place a cap on the length of his sermons and to make deliberate use of repetition. He will have to tailor his vocabulary and sermon structure so that sustained listening isn’t so demanding that it encourages the faithful to tune him out. In some ways, this simplifies life for the preacher. If there are multiple points that merit expounding in a given reading for the day, the preacher can pick just one, and leave the others for when the reading next occurs. What are your thoughts? What else can the contemporary Orthodox preacher do to cope with the short attention span phenomenon? I’d like to hear from the “hearers,” too. I’ll tackle more of those other preaching challenges next time.